My latest Facebook contest is in full swing! Entries are being accepted NOW. Don’t miss out on this opportunity to win a free photo session with me! Will your baby be my 2013 Baby New Year? “Like” Melanie G. Photography on Facebook. 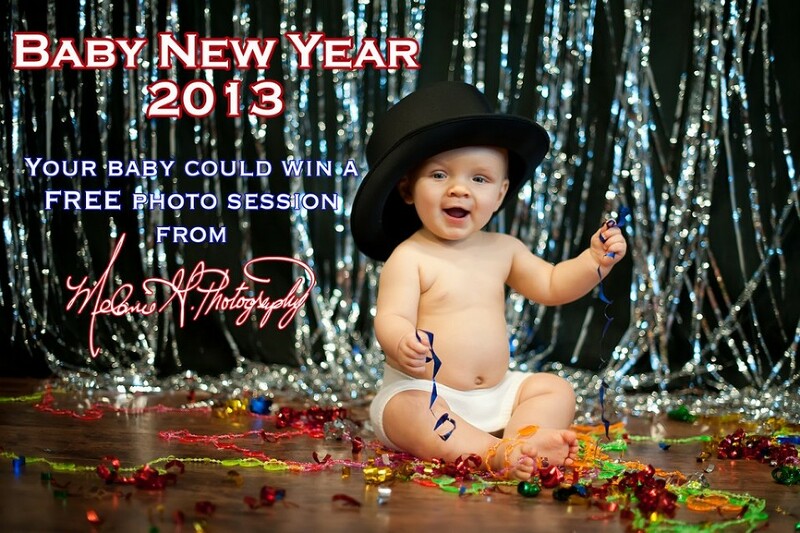 Submit photo of your baby (age 0-12 months) FB message or email to Melanie Gnewikow by 11:59 pm on January 1, 2013. Melanie G. Photography will post the contest photo album on January 2, 2013. The voting period will last from January 3-11, 2013. Vote by placing a comment under the contestant photo. Only comments will count, not “likes”. The winner will be the picture with the most comments by 9pm CT, January 11, 2013. Melanie G. Photography will post the contest winner on her FB page January 12, 2013. All contestants must be between newborn to 12 months old at the time of entry. All contestants and voters must “like” Melanie G. Photography on Facebook for votes to be counted as valid. Only one vote is allowed per person per day durning the voting period. “Likes” on the contestant photo will not count as a vote. The winner must allow full release rights to Melanie G. Photography.